English is central to the curriculum at school as it is the gateway to all learning. Everyone needs to be able to communicate effectively and appropriately in a range of situations. Learners in school communicate daily through speaking and listening, reading and writing. We aim to deliver a high quality English curriculum that gives children the best possible opportunities to become confident, literate, successful members of society with a deep love and understanding of English language and literature. We believe the development of Literacy skills is central to improving a child's life chances. Teachers have high expectations for all children to achieve and enjoy English and to be able to use the skills they have acquired in a range of contexts. We strive to ensure all children can communicate clearly in spoken and written form and become masters of language. 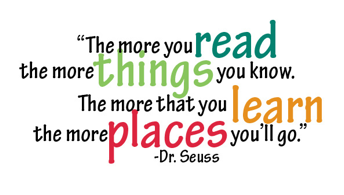 Rich texts are at the heart of our teaching and a love for reading is promoted throughout the school. Teachers use inspirational ideas to engage children in work providing memorable experiences, bringing topics to life through real life contexts. ‘Stunning starts’ are planned to launch a unit of work with ‘fantastic finishes’ at the end. ‘Literature should jolt the senses, making us feel alive. In school, we only have time to read books that bite and sting… if the books that we read do not wake us with a blow to the head, what’s the point in reading? A book must be the axe, which smashes the frozen sea within us. Literature in the classroom should have that extra bite – to surprise, challenge, delight and create wonder as well as the inexplicable charm of rhythmic and memorable language. We should read, explore and perform stories and poems that preserve and celebrate experience, both real and imagined; poems and stories that will act as a catalyst to children’s own writing; poems and stories that ring true; poems and stories that help us find our own place in the world; poems and stories that will act as deep grooves in the memory; poems and stories that will act as lights in the darkness; poems and stories that touch our common genius. We want our children to confidently tackle new words so they can go on to read any kind of text fluently and to read for enjoyment as well as purpose. Alongside learning to read, the children will want to show their skills to communicate in writing. This will be an exciting and powerful time for all of our children as they realise that they can share their ideas and thoughts with others. As our children progress on their phonics journey, they will apply different strategies and explain to others the reason for learning phonics and how it aids them in their learning. Our children will be outstanding in phonics. Children in Reception and Key Stage 1 follow the synthetic phonics approach, using the ‘Letters and Sounds’ programme. It is an approach to teaching phonics in which individual letters or letter sounds are blended to form groups of letters or sounds, and those groups are then blended to form complete words. We use the Oxford Reading Tree. This provides a variety of fiction and non–fiction books to develop children’s reading range. Children learn to read at different rates. This scheme continues throughout their whole time at Hatch Ride. Our daily phonics sessions are fun, involving lots of speaking, listening and games. The emphasis is on children’s active participation. They learn to use their phonic knowledge for reading and writing activities and in their independent play. Letters and Sounds is divided into six phases, with each phase building on the skills and knowledge of previous learning. Children have time to practise and rapidly expand their ability to read and spell words. They are also taught to read and spell ‘tricky words’ – words with spellings that are unusual or that children have not yet been taught. These include the words ‘to’, ‘was’, ‘said’ and ‘the’ – you can’t really break the sounds down for such words so it’s better to just ‘recognise’ them. Phase one will have begun in Nursery, for those that are ready we progress on to stage two. This phase paves the way for the systematic learning of phonics. During this phase especially, we plan activities that will help children to listen attentively to sounds around them, such as the sounds of their toys and to sounds in spoken language. We teach a wide range of nursery rhymes and songs and read good books to and with the children. This helps to increase the number of words they know – their vocabulary – and helps them talk confidently about books. The children learn to identify rhyme and alliteration. Please click on the link below for further information and a variety of resources and games that can be used at home.